Efficiency, reliability, long life, and environmental sustainability are all required for the next generation of turbomachinery. Fortunately, advanced bearing technologies are available today that eliminate wear and the need for oil-based lubricants. 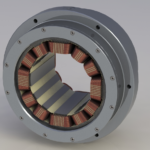 At Radiant Physics, we have extensive experience with two types of advanced bearing types. For pressurized gas bearings, a rotating shaft floats on a cushion of gas, while for magnetic bearings, magnetic forces support and position the rotating shaft. Both types eliminate surface contact and wear. The choice of which bearing system is best for a particular application is determined by the rotordynamic requirements, the availability of suitable plant utilities, and cost. The economic competitiveness and high performance of our gas bearings make them an attractive alternative to magnetic bearings for many applications. Radiant Physics has developed proprietary pressurized gas bearing technology for high speed rotating machines that require high performance and industrial robustness. These bearings were specifically designed for tolerance to gas impurities and temperature fluctuations. While pressurized gas bearings available elsewhere are optimized to achieve high stiffness and low gas consumption, our gas bearings are optimized for dynamic stability, manufacturability, and cost effectiveness. This extends their applicability from clean, laboratory environments to a wide range of industrial applications. The size of a pressurized gas bearing determines its load capacity and its gas consumption. Some representative sizes and values are shown below for bearings supplied with air at 115 psig (8 barg). These tables are presented for comparison purposes only. Contact us to learn more about why our gas bearings might be the right choice for your application. Users of turbomachines in a variety of commercial sectors are frequently asking for products with magnetic bearings from their OEM suppliers. Because of the success in commercializing magnetic bearing technology in sectors such as Oil and Gas and HVAC, end users are increasingly aware of the reduction in operating costs afforded by magnetic bearings compared to oil-lubricated machines. The savings come from much lower viscous friction in the bearings and much lower maintenance requirements. Many turbomachinery OEMs consider developing new products with magnetic bearings, but are reluctant when they discover the high price–incorporating magnetic bearings into a turbomachine requires a significant investment in product development and testing. Even after this initial investment, the OEM is captive to the few companies that currently offer magnetic bearings as commercial products. And changing from one magnetic bearing supplier to another involves more non-recurring engineering as magnetic bearings from different suppliers are not inter-changeable. For these reasons, some OEMs have opted to acquire the internal capability to offer magnetic bearings for their own products. However, this comes with significant technical and economic risk. At Radiant Physics, we can assist OEMs develop and implement a strategy for offering magnetic bearings in their products. By working with us, an OEM can greatly accelerate development and lower the risk. Contact us to learn more about we can help you offer magnetic bearings in your products. We are a small company that helps companies of all sizes develop and commercialize products related to industrial technology and medical devices.